Casa Salamander occupies an elevated position on the edge of a well-maintained and gated residential area on the banks of the River Guadiana, at the southern border between Spain and Portugal. Access is by self-drive car from Faro, or southern Spanish airports, of which Seville is closest. Some homes locally are occupied all year, others, like ours, are holiday homes. Complementing its own spacious outdoor areas is the shared garden with 2 pools and relaxing area. The house is furnished with adults in mind, and to a most comfortable standard. New for 2018! Spanish granite worktops to the whole kitchen and new utility room fittings. On site, there are walks, rambles, and the Costa Esuri golf club. Bird-watching, fishing and water-based sports are also local, though to get about, you should have access to a car. With a car, you are free to explore the kilometres of wide open countryside around, in this fruit-growing region. Ayamonte, just 5km away, is a vibrant and colourful, working border town and fishing port, with cafes, bars & restaurants. Isla Canela beach is closest. For those who don't wish to go far, the communal garden offers a lovely pool and the house has several terraces, for sun-seekers or shade-lovers. We are Alan and Susan Field, still young at heart! We lived for 20 years in France, till 2012, and own a golf holiday business, Fields Fairway. Since we purchased Casa Salamander in 2011, we have been regular visitors there, and have taken care to upgrade and fully renovate, providing quality furnishings and all home comforts, home from home. Outdoors, we created a patio garden to complement the other wonderful terrace a restful outdoor spaces for us and our guests. As visitors to the Algarve over many years, we had often crossed into Spain on trips, and spent many happy holidays in Spain, too. We love this friendly area because it remains largely unspoiled and offers opportunities to be by the sea, relax, play sports and live well, and inexpensively. As golfers, we enjoy finding new courses and lovely walks! We lived in Europe for over 20 years, and have visited many countries. 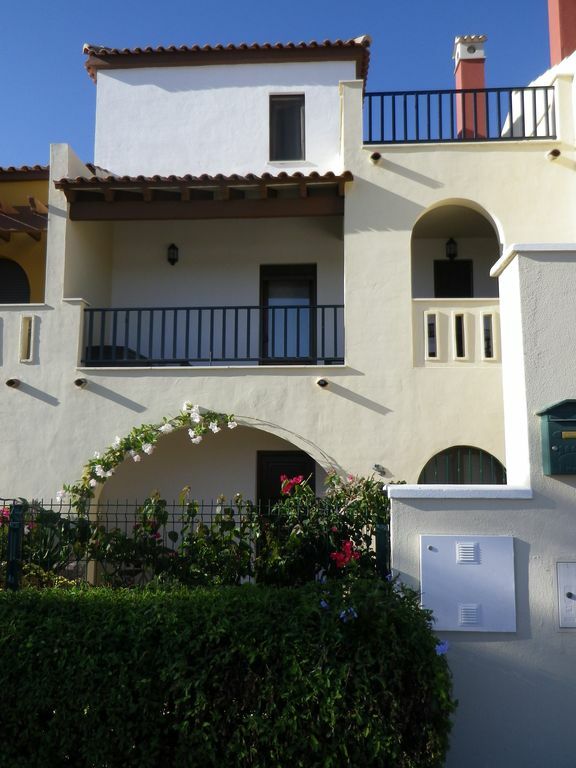 Our main purchase criteria were a fairly quiet location, but with easy and close access to the sea, golf and good restaurants and local facilities. In short, away from the more populated 'costas', and offering a taste of authentic Spanish life, even the 'fiestas'. Ayamonte people are friendly, the local produce is excellent both in quality and value and there is such easy access to both the Portuguese and Spanish walks, sport and for those who need it, shopping, too! Within ten minutes by car, we can be on beautiful sandy beaches, deserted out of the main summer months, and enjoy either Spanish or Portuguese cuisine and 'chippies' here! We try to live as 'locals' and sample fresh local food. Easily reached by road, and airports at Faro (40 mins) and Seville (90 mins) are the most convenient arrival points. A short link road connects the Costa Esuri development with Ayamonte, just 5 km away, from which you have spectacular views over the River Guardiana and the bridge between Spain and Portugal. Shopping is easy, at supermarkets [3km] or market and shops in Ayamonte. Once there, everything is on hand. The house is fitted out and furnished to an extremely high should find everything there to self-cater and relax. Air-conditioned comfort and we have great outdoor spaces, too; proper furniture for outdoors dining, a gas barbecue, comfortable loungers & access from the garden to the shared pools and landscaped gardens. You can find sun or shade, too. Fabulous view! En-suite bathroom to 2nd floor bedroom with wc, bath & screened shower over, bidet and vanity unit. Bathroom on 1st floor with bath/shower over, bidet, WC and washbasin. Both bathrooms have heated towel radiators. Ground floor WC, with large washbasin. Ground floor living & dining room. Air-conditioning/heating. Leather 3-piece suite, occasional tables; flat-screen TV, UK & local channels, home-cinema/DVD & CD players. Oak dining table, leather chairs, 'sideboard' with glasses and tableware. Bookshelf. Fully-equipped kitchen with electric hob and oven, extractor hood, large fridge-freezer. dishwasher, microwave/grill, juicer, kettle, coffee machine, toaster. Fan and window, fly screens. Plenty of glasses, plates and cutlery...all you need to self-cater! Costa Esuri has a golf course and within 30 minutes or so, guests can reach many other Spanish and Portuguese courses. We are able to arrange golf breaks, staying at the house, and effect golf bookings on behalf of our guests, at the best rates we can achieve. The nearest Spanish courses are: Isla Canela, Islantilla, El Rompido, la Monacilla & Bellavista; in Portugal, Castro Marim, Quinta do Vale, Quinta da Ria, Quinta da Cima, Monte Rei, Benamor...and plenty more a bit further afield. The on-site Esuri course presents a challenge, as it is close by, and some holes run along, the Guardiana river estuary. Open and links-like in part, some undulation in others, a varied and interesting layout and ideal for holiday golf. Excellent clean well equipped house. Beautiful garden and pool. From our house, ramblers can gain access to GR footpaths and there are many walks within a short car ride away, in both Spain, in the marismas, country parks and coastal regions, and in Portugal, along and around the Ria Formosa areas. Just a few minutes by car, to cover the 13km or so to the beautiful sandy beaches of Andalucia or the Algarve...best of both worlds! Our favourites are Isla Canela, Spain and Praia Verde [Portugal]. Ayamonte is a port, provides a ferry link across the river to Portugal, though these days it's quicker and free of charge, by bridge. Across the river is Vila Real San Antonio, also a fishing port; it's fun to compare the differences in the two countries. You can be in Ayamonte by car in 5 minutes. Faro [Portugal] is nearest, 40 minutes by motorway from the house by car. Seville is next closest, 90 minutes, also by motorway. Car hire is essential as there is no public transport link to the Costa Esuri development. However, it is possible to use bus and train services from Ayamonte in Spain, or Vila Real in Portugal, to explore further, if you don't wish to drive. Motorway driving in Spain is easy, so a long Channel crossing could see you drive down to the south of Spain, but dearer. Ayamonte 5km (shops) /7km (port). Beach 13 km at Isla Canela. Vila Real San Antonio 13km. Huelva 50 km (all fast road, about 30 minutes). Tavira 40 km (all fast roads, about 20 minutes). Faro 65 km. (All distances from Google maps). Shopping: at local shopping centre, about 5 minutes away, large supermarket for food and drink shopping; discount supermarket about 2 minutes further on. Both with free parking and open 10am-10 pm, Monday to Saturday. Sunday shopping is possible in Portugal, where shopping centres are open 10am- 11pm. Remember Portugal time is one hour behind Spanish time! Many markets, daily Mon-Sat in Ayamonte for great fish, especially. Many local specialities, not least of which is the ham. In Ayamonte, plenty of restaurants, remember the Spanish eat both lunch and dinner late, though some places offer a day-long service. The day menus offer great value. Banks open Mon-Fri, 08.30 till 2 or 2.30. There is a post office near the port in Ayamonte. Pharmacies are very helpful in Spain, and keep late hours, some open till 9.30 at night. Do not forget that local shops tend to operate 10-1.30 or 2, then 4.30 or 5-8 -9.30. On Costa Esuri there is a local restaurant and the golf club house, both open to visitors for meals. Huelva, Seville, Cadiz and Jerez are all within striking distance, by car. On the Portuguese side, Tavira and Faro are both delightful and provide an insight into history and modern daily life; both are great for shopping, too! At the house we have provided information for visitors to the area and a comprehensive map book. Booking Notes: Please book by completing an enquiry,, in the first instance. We will confirm availability and request a 50 % deposit, the balance payable at least one month before travel. A security deposit to cover any damages and will be returned on departure, in full, when you give back the keys. A local manager will meet you and will be on hand to answer any questions or deal with any local emergencies you may have...hopefully none! Changeover Day: We can be flexible, depending on other bookings. Weekends preferred. Out of season, we can also be flexible on lengths of stay, eg 10 days, etc, again, subject to others and availability at the time you book. Notes on prices: Reductions for longer stays...please ask. You may pay in euros, if you prefer. Price on request. Household linen and cleaning, included as above, but additional services/extra cleaning can be arranged, as required. Midweek change: towels 10€/person; bedlinen 15€/bed; extra house clean 50€.